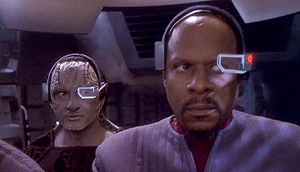 Ask Google where it got the idea for Google Glass and they'll readily admit it was Star Trek. The technology aboard the USS Enterprise in the 23rd century is what we're seeing for real 200 years earlier. And wearables aren't just confined to headwear - flexible electronics have opened up a plethora of possibilities for fabrics and accessories. 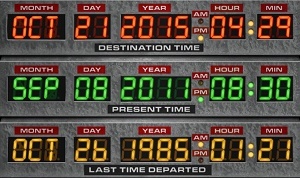 And who can forget Marty McFly's self-lacing trainers from 2015? While we haven't seen self-drying clothes, there is speculation that Nike will be releasing a self-lacing shoe in 2015. A lot of people will say that futurists missed a trick predicting the flat screen LCD, but screens were used in almost all vehicles that we saw on Star Trek, Star Wars and even Back to the Future's Delorian. Who can forget the seven-segmented display that showed us where in the future, or the past, we were heading? What is fascinating about these types of displays, is that we are now seeing flexible LCDs that can conform to dashboards - but since the Delorian was of the 80s, and not of 2015, we'll forgive the trilogy for maintaining the retro look on the display. It seems that Google wasn't the only company to look to Star Trek for inspiration for product development. Consider the Personal Access Display Device, or PADD - a handheld computer interface used by the crew of the UUS Enterprise. Sound familiar? Apple certainly brought tablet computing to the mainstream with its iPad, and who can say they've never sat in a meeting, or in front of the TV, swiping and tapping away on one of the most convenient tech developments of this century? So what's next? Foldable displays, rollable displays, and perhaps even air-touch displays. Sadly we haven't had any mainstream products yet, but there are many research projects and quirky kickstarters that are looking to emulate Marty's hovering skateboard, as well as Luke's Skywalker's landspeeder. Now the 21st October 2015 has been and gone, futurists have looked forward another 30 years and made some great predictions, including an integrated and connected Internet of Things based on sensors and paired with wearables.